اعظم‌پور, فاطمه, روشندل کاهو, امین, احمدی‌فرد, علیرضا, حیدریان, علیرضا. (777). شناسایی گسل‌ها در داده‌های لرزه‌ای بازتابی به کمک نشانگر سوبل. مجله ژئوفیزیک ایران, 10(4), 85-96. فاطمه اعظم‌پور; امین روشندل کاهو; علیرضا احمدی‌فرد; علیرضا حیدریان. "شناسایی گسل‌ها در داده‌های لرزه‌ای بازتابی به کمک نشانگر سوبل". 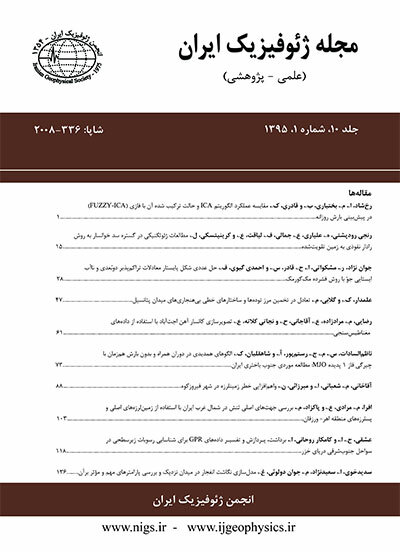 مجله ژئوفیزیک ایران, 10, 4, 777, 85-96. اعظم‌پور, فاطمه, روشندل کاهو, امین, احمدی‌فرد, علیرضا, حیدریان, علیرضا. (777). 'شناسایی گسل‌ها در داده‌های لرزه‌ای بازتابی به کمک نشانگر سوبل', مجله ژئوفیزیک ایران, 10(4), pp. 85-96. اعظم‌پور, فاطمه, روشندل کاهو, امین, احمدی‌فرد, علیرضا, حیدریان, علیرضا. شناسایی گسل‌ها در داده‌های لرزه‌ای بازتابی به کمک نشانگر سوبل. مجله ژئوفیزیک ایران, 777; 10(4): 85-96. گسل‌ها یکی از مهم‌ترین رویدادهای زمین‌شناسی هستند که در اکتشافات معدنی، هیدروکربنی و مطالعات زمین‌شناختی از اهمیت بسیار زیادی برخوردارند. گسل‌ها به‌منزله یک تله ساختاری هیدروکربنی می‌باشند و از این‌رو شناخت و تعیین محل دقیق آنها عامل مهمی در توصیف مخازن هیدروکربنی است. در داده‌های لرزه‌ای بازتابی، گسل‌ها به‌صورت ناپیوستگی در امتداد بازتابنده‌ها و تغییر دامنه مشاهده می‌شوند. به‌دلیل ماهیت داده‌های لرزه‌ای، شناسایی صفحه گسل در این داده‌ها، فرایندی دشوار است و تعیین محل دقیق آنها به‌تنهایی از روی داده لرزه‌ای به‌‌ندرت امکان‌پذیر است. نشانگرهای لرزه‌ای، ابزاری هستند که اطلاعات نهفته در داده‌های لرزه‌ای را آشکار می‌نمایند و امکان تفسیر کمّی را در اختیار مفسر لرزه‌نگاری فراهم می‌آورند. در این مقاله، صافی سوبل دو‌بُعدی و سه‌بُعدی به‌منزله یک نشانگر لرزه‌ای برای شناسایی و تعیین موقعیت گسل‌ها در داده لرزه‌ای بازتابی معرفی می‌شود. این صافی، یکی از ابزارهای پرکاربرد در فرایند تشخیص لبه در پردازش تصاویر است که گرادیان تصویر را محاسبه می‌کند و به تغییرات دامنه حساس است. به‌منظور بررسی عملکرد این روش در شناسایی گسل‌ها، نشانگر سوبل بر روی داده‌های لرزه‌ای مصنوعی و واقعی در دو حالت دوبعدی و سه‌بعدی مورد بررسی قرار می‌گیرد و نتایج حاصل با نتایج نشانگر همدوسی مقایسه می‌شود. بررسی نتایج به‌دست آمده نشان می‌دهد که نشانگر سوبل می‌تواند به‌مثابه یک نشانگر مناسب برای شناسایی گسل‌ها در داده‌های لرزه‌ای بازتابی مورد استفاده قرار بگیرد. Faults are among the most important geological events for hydrocarbon and mineral exploration and geological studies. They are considered as the major hydrocarbon traps whose detection in seismic reflection data have important roles in hydrocarbon reservoir characterization and geomechanical studies of reservoirs. According to previous studies, approximately 75% of the oil fields are associated with faults. Faults can influence the efficiency of hydrocarbon reservoirs by improving the permeability of a porous medium. Faults are defined as a discontinuity along a geological layer or geological event which is the result of the failure of that layer or event against the tension exerted on it. Reflection seismology is one of the best geophysical methods for hydrocarbon exploration. Various methods have been introduced to identify faults in seismic reflection data. In seismic reflection data, faults can be seen as discontinuities along the reflectors. One of the conventional methods of interpretation of the faults is a manual interpretation of seismic horizons which is a highly time-consuming process. Due to the nature of the seismic data, identification of faults plane in this data is a difficult process. Seismic attributes are considered as useful tools that will reveal hidden information in seismic data which can help the interpreters to detect faults. In fact, a seismic attribute can be used as a filter that makes the structural and stratigraphic information more apparent from the seismic data. There are several seismic attributes for faults detection in reflection seismic data such as coherency, curvature, chaos, and variance. The seismic coherence attribute is one of the most common attributes for fault detection. This attribute is calculated by different criteria such as cross-correlation, semblance, eigenstructure, gradient structure tensor. In this paper, we used a new form of a seismic attribute for edge detection. It is the Sobel filter which is a widely used tool in image processing, computer vision, and edge detection problems. It is the first derivative of the image and is sensitive to amplitude changes. It is a discrete differentiation operator, computing an approximation of the gradient of the image intensity function by convolving the isotropic operators. These operators are extensible to higher sizes and dimensions. Therefore, the Sobel attributes can be used in two- and three-dimensional seismic data. It can be used in seismic data for identification of the geological events such as faults, salt dome, and buried channels. The efficiency of dip guided Sobel attribute is evaluated by applying it to both synthetic and real seismic data. We compared the obtained results with the results of conventional seismic coherency attributes. In this paper, we used the eigenstructure-based coherency attribute. Comparison of the results of synthetic models in both noise-free and noisy cases in two and three dimensions show that the dip guided Sobel filter can be a good alternative for coherence attributes. In comparison with the coherence attributes, dip guided Sobel attribute is a short run time process and has large stability against noise. In real seismic tests in two and three dimensions, the obtained results from two attributes show that the dip guided Sobel attribute performs better than the eigenstructure-based coherency attribute. اعظم‌پور، ف.، 1393، استفاده از نشانگر لرزه‌ای سوبل در تفسیر داده‌های لرزه‌ای بازتابی: پایان‌نامه کارشناسی ‌ارشد، دانشکده مهندسی معدن، نفت و ژئوفیزیک، دانشگاه صنعتی شاهرود. اعظم‌پور، ف.، روشندل کاهو، ا.، احمدی‌فرد، ع.، و حیدریان، ع.، 1393الف، نشانگر لرزه‌ای سوبل متوازن برای شناسایی گنبد نمکی: اولین همایش ذخیره‌سازی زیرزمینی نفت و گاز، تهران، ایران. اعظم‌پور، ف.، روشندل کاهو، ا.، احمدی‌فرد، ع.، و حیدریان، ع.، 1393ب، شناسایی کانال‌های مدفون با استفاده از نشانگر لرزه‌ای سوبل سه­بعدی: دومین همایش ملی نفت و گاز ایران، کرمان، ایران. Aqrawi, A. A., and Boe, T. H., 2011, Improved fault segmentation using a dip guided and modified 3D Sobel filter: SEG Technical Program Expanded Abstracts, 999–1003. Aqrawi, A. A., Boe, T. H., and Barros, S., 2011, Detecting salt domes using a dip guided 3D Sobel seismic attribute: SEG Technical Program Expanded Abstracts, 1014–1018. Chopra, S., Kumar, R., and Marfurt, K. J., 2014, Seismic discontinuity attributes and Sobel filtering: Presented at 84th Annual International Meeting, SEG, Extended Abstracts. Chopra, S., and Marfurt, K. J., 2007, Seismic attributes for prospect identification and reservoir characterization: Society of Exploration Geophysicists. Gibson, D., Spann, M., Turner, J., and Wright, T., 2005, Fault surface detection in 3-D seismic data: Geoscience and Remote Sensing, IEEE Transactions on Geoscience and Remote Sensing, 43, 2094–2102. Gonzalez, R. C., and Woods, R. E., 2008, Digital Image Processing: Pearson/Prentice Hall. Groshong, R. H., 2006, 3-D Structural Geology: A Practical Guide to Quantitative Surface and Subsurface Map Interpretation: Springer. Gupta, S., and Mazumdar, S. G., 2013, Sobel edge detection algorithm: Int. J. Computer Science and Management Res., 2, 1578–1583. Hafiz, D. A., Sheta, W. M., Bayoumi, S., and Youssef, B. A., 2011, A new approach for 3D range image segmentation using gradient method: J. Computer Science, 7, 475–487. Iske, A., and Randen, T., 2005, Mathematical Methods and Modelling in Hydrocarbon Exploration and Production: Springer. Islam, S. Z., Islam, S. Z., Jidin, R., and Mohd. Alauddin Mohd, A., 2010, Execution time optimization analysis on multiple algorithms performance of moving object edge detection: AIP Conference Proceedings, 1239, No. 1, 289–295. Jing, Z., Yanqing, Z., Zhigang, C., and Jianhua, L., 2007, Detecting boundary of salt dome in seismic data with edge-detection technique: SEG Technical Program Expanded Abstracts, 26, No. 1, 1392–1396. Karachentsev, I. D., Tully, R. B., Dolphin, A., Sharina, M., Makarova, L., Makarov, D., Sakai, S., Shaya, E. J., Kashibadze, O. G., Karachentseva, V., and Rizzi, L., 2007, The Hubble Flow around the Centaurus A/M83 Galaxy Complex: The Astronomical Journal, 133, 534–537. Kearey, P., Brooks, M., and Hill, I., 2002, An Introduction to Geophysical Exploration: Wiley, 272 pp. Marfurt, K. J., Kirlin, R. L., Farmer, S. L., and Bahorich, M. S., 1998, 3-D seismic attributes using a semblance-based coherency algorithm: Geophysics, 63, 1150–1165. Sheriff, R. E., and L. P. Geldart, 1995, Exploration Seismology: Cambridge University Press, 628 pp. Sobel, I., and Feldman, G., 1968, A 3x3 Isotropic Gradient Operator for Image Processing: presented at the Stanford Artificial Project in Pattern Classification and Scene Analysis, Duda, R., and Hart, P., Eds., John Wiley & Sons, 271–272. Wilson, K. S., 2001, Comparing edge-detection algorithm performance under degrading signal-to-noise ratio conditions: Proc. SPIE 4387, Optical Pattern Recognition XII, 186, 186–191.